A snapshot from the cul-de-sac last evening, at the conclusion of The Boo’s walk. Albuquerque has its problems, to be sure. Joblessness, crime, drivers who should not be permitted to operate grocery-store scooters … but it flat brings the sunset. * The headline is from Ed Abbey’s “The Monkey Wrench Gang,” which featured another elderly, bearded weirdo from Albuquerque. This entry was posted on June 26, 2017 at 7:33 am and is filed under Albuquerque, Dogs. You can follow any responses to this entry through the RSS 2.0 feed. You can leave a response, or trackback from your own site. Gorgeous. Is this where Maxfield Parrish got his inspiration? Your skies out there are stunning night and day. The evening walk must be tough for the one-eyed Boo. He doesn’t know that his footpads would scorch if you walked in more light. The sunsets are unreal, Libby. Some evenings if you look west from up here in the Sandia foothills it’s almost like looking at the ocean. It’s gotta be a whole lot cooler than 100 degrees before we walk the little weirdo, too. He’s a lot closer to the ground and hates heat even more than I do. 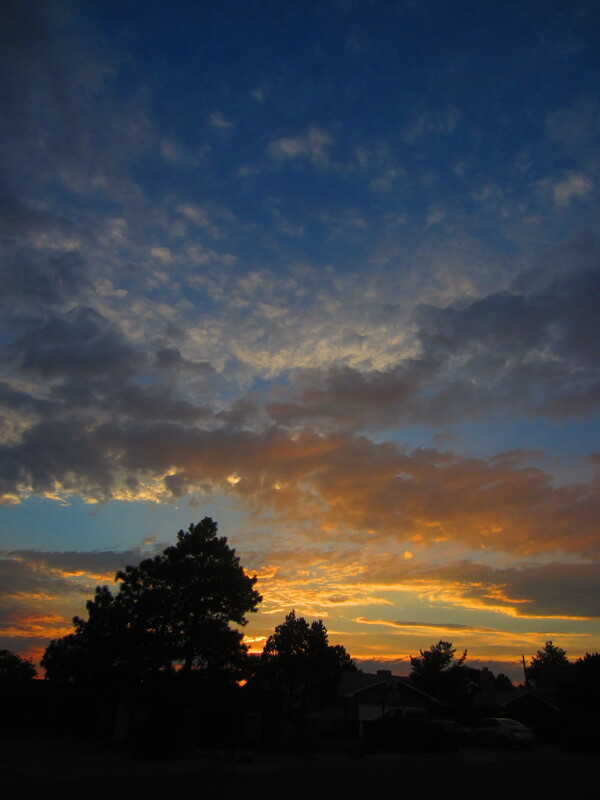 PO’G: You seem to be enjoying the positive aspects of ABQ…..thanks for sharing! JD, I need to pay more attention to the eastern view, for sure. There’s a short moment that the previous owner used to call “the golden hour” that’s pretty to look at. I think you get the true watermelon look from a little further north, by Bernalillo. That’s where the old Watermelon Mountain Classic used to start. At Yuma Foothills, the NE surrounding dark rocky hills, show their exquisite late afternoon glow, reddish with golden backlighting of cholla, between 4-5pm. Love your photo, makes me homesick for SW ! I didn’t know that Sandia meant watermelon in Spanish. Thanks JD. Easier than “Huachuca” to say and translate. Nice picture Patrick, again. Boo, sun, and mountains are inspiring. By the way, Huachuca means thunder in Apache. Pat: Give “Empire of the Summer Moon” a read. Primarily about the Comanches; but what an insight into life in the SW during the Indian/Native American ( I prefer the Canadian “First Nation” nomenclature) era. “Huachuca!” always sounds to me like an Aztec sneezing. i hope you’re not planning on riding off into one of those sunsets anytime soon. Herself and I were discussing my retirement options while walking The Boo. She reminded me that we own a shovel, and a back yard, and that it would be a good long while before anyone sent out a search party. Sandy, and our friend and fellow cyclist Deb, keep reminding me about a shovel and the endless desert around here. I have managed to behave so far. i sense the makings of a good detective novel. the detective scans the stable of bikes, notices the missing bike (that your wife buried with you) and concludes the victim would never ride that particular bike for the kind of road trip you were supposed to be on. ..as a former LUGNUT lurker/participant (LangleyInTierrasanta) having serious Tour withdrawals, I just stopped by to see if there was any LUG news and had yet another Oak Ridge related “small world” experience. I was born there and when I was two my dad (a physicist) took a job in Albuquerque we stayed there until 1977 and then moved back to OR. I swear if you wear your ORHS or Big Ed’s tee shirt you almost always are accosted by someone from there or who has spent time there. I know what you mean about the sunsets in Albuquerque. They are the most beautiful I have ever seen on my 51 trips around the sun on our way-cool spaceship.